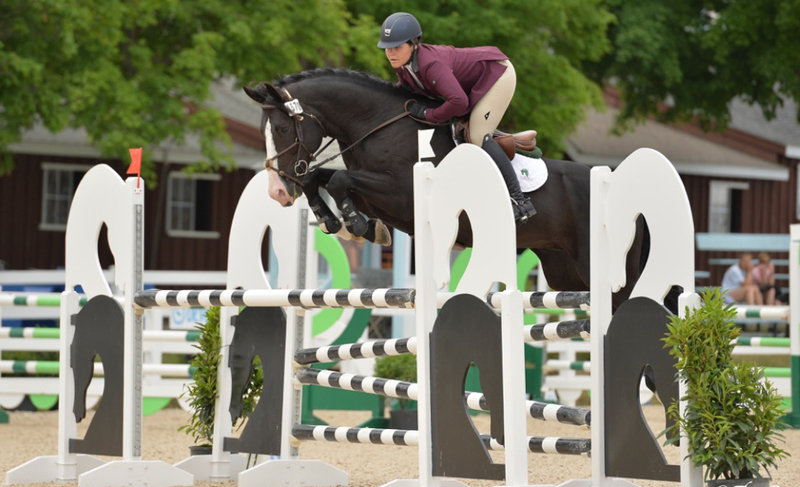 Devon, PA – May 28, 2015 – AliBoo Farm’s crop of young horses jumped to the top of the leader board in the Five-Year-Old and Six-Year-Old classes at the historic Devon Horse Show this week. Years of planning and investing in it’s breeding and training program coupled with training by the AliBoo team, are reaping big rewards for the family business. AliBoo’s riders, Taylor and Alison Flury, piloted their stock to be the only horses to jump clean in Wednesday’s class. AliBoo’s Catania Saflo Z (Chippendale Z x Landor S) had a clean round and their Diamant D’Heure ABF (Diamant de Semilly x Rio Grande) followed right behind with another clear round. Cosmea Z (Calvados x Lupicor) put in the third clear round while AliBoo’s Carrasca Z (Asca Z x Calato) was the only four faulter in the class. The remaining five-year-olds had eight faults or more. In the competitive Six-Year-Old class, Jett B owned by Iconic Bay Equestrian, went to the head of the class. Jett B shut off the timers with quickest round of only four horses to go double clean over the Michel Vaillancourt designed track. AliBoo Farm has been bringing along the Belgian Warmblood stallion (Simsalabim x Chin Chin) for about a year now for the owners. Thursday proved the consistency of the team as Catania Saflo Z put in a clear round once again in the second class of the Five-Year-Olds. Carrasca Z also jumped clean again for AliBoo in the class, which was an East Coast Young Jumper Qualifying Class. AliBoo takes pride in the development and training of young horses and have had great success with not only their own horses but also with young horses owned by others such as Iconic Bay Equestrian out of FL, and Blue Gate Farm (Denise Wilson). Some of the horses they have brought along include Role Model, who won a Lake St. Louis Grand Prix this winter after being the Five and Six-Year-Old National Young Jumper Horse of the Year, Clever Girl, who has been a consistent winner in the Junior Jumper Ring during WEF 2015, and Corcovado BG, who is also earning top ribbons as a young jumper in the Midwest and Wellington. Along with starting and training, AliBoo Farm does extensive research on bloodlines. Their stallion, Diamant d’Heure ABF won the coveted American Best Bred Horse at the Spy Coat Young Horse Show Finals in 2014. It was here that Carrasca Z earned a perfect score of 10 in the free jumping chute. He is the first horse to earn perfect 10’s across the board in the program. AliBoo offers both breeding and breeding consulting services.